The Thing on Netflix's "Arrested Development"! If I think too much about the current television lineup on any network, I tend to lose faith in much of humanity. I try not to place too high a level of importance on what's playing on TV, which, since its inception, has been by and large a vast wasteland, but when shows like The Big Bang Theory draw in millions upon millions of viewers, it seems like the End Times might just be upon us. Similarly, it seems that many of my favorite shows get the axe well before their time, which leads me to the only logical conclusion available: I am apparently a curse on the shows that I watch. Perhaps I should start to watch shows that I hate, then, and take one for the team? I shudder at the thought. In any case, the show Arrested Development is a good example of this curse; in fact, I put such a powerful curse on it that it got cancelled before I even started watching it! Luckily, though, Netflix was good enough to rescue it and new episodes of a much-delayed fourth season have just begun airing. If you haven't watched this show yet, you should get to it! Start at the beginning and work your way up. I'm trying to pace myself with this season, and so far I've managed to limit myself to a respectable two episodes a day. The fifth episode of the season focuses on the character of Tobias Fünke. 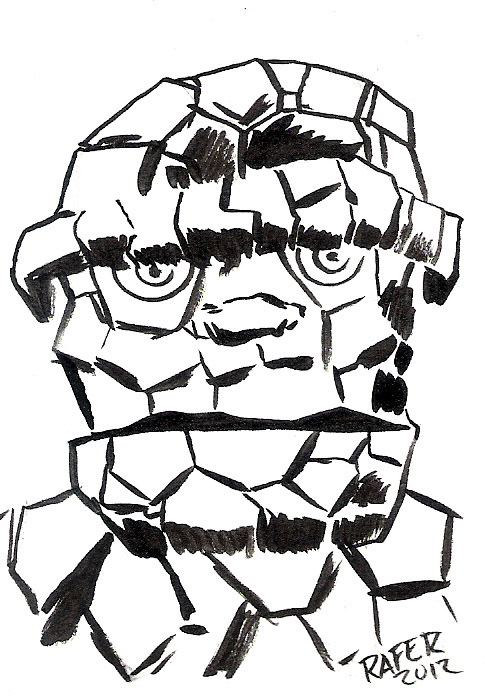 Without giving away too much of the plot, I can't hold back the fact that the Fantastic Four and the Thing specifically plays a big part in this episode. Above you'll see the show's take on the Thing and the Invisible Girl. You might also notice a nifty easter egg in the form of the background movie poster, advertising for "Gangie Face Lift 4". 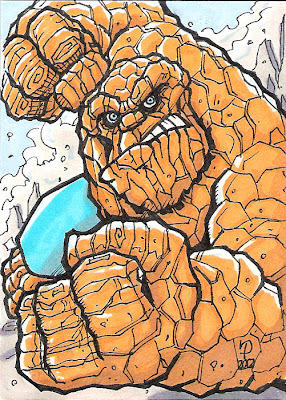 Regardless of the intent, it was really fun to see the Thing referenced so heavily on the new season of Arrested Development. This season has a different feel than the previous Fox series, but there are still plenty of laughs, some great uncomfortable moments, and a lot of great things to build off of. I've got nine more episodes to go and I'm looking forward to seeing how everything is brought together. Preorder Tick: Big Blue Destiny Preview Book now! If you flip through the May edition of Diamond Comics' Previews catalog, you'll see that one of my greatest wishes has been granted: New England Comics didn't fire me after the Tick Free Comic Book Day came out! In fact, if you look at page 329 of the catalog, you'll see that there's a kind of new Tick book available for pre-order, and I've got an 11-page story within its covers! Tick: Big Blue Destiny Preview Book reprints the first official chapter of Eli Stone's run on the book, and it also features a brand new story that takes place right before the Stone story! The picture above says "10 pages", but it's 11. Trust me. Duane Redhead once again joins me for the prequel-of-sorts, and I've got to say that his artwork looks spectacular. 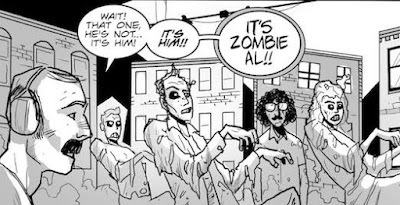 We were both just wading into the waters in the FCBD book, so to speak, and I think you'll notice that we're a little more comfortable with the characters this time around. I won't spoil any surprises (I'm also probably not allowed to spoil any surprises), but without giving anything away, I'll say that this new story features a montage scene. That's pretty cool. Kids like montages, right? Anyway, if you liked the FCBD issue at all, I'd really appreciate it if you'd consider putting in an order for this new issues, due out in stores in July (just in time for Comic-Con!). It's specially-priced at only $1.00, so it's super cheap! And it's got 36 pages of great Tick stories inside, 11 of which are written by me. I'm pretty darn excited for this book. It always takes me a while to decompress after any big event, and while this year's Free Comic Book Day doesn't match up to something like, say, Comic-Con, it was still a pretty big deal for me. 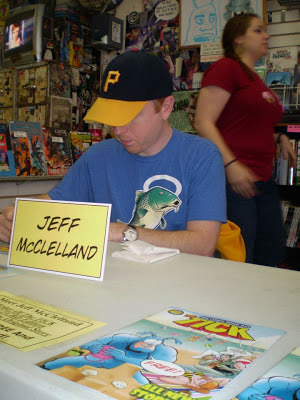 As with a lot of things of a similar nature, I spent a lot of time on the buildup to FCBD 2013, and the event itself flew by in a blur. There are a lot of things I'll take from Saturday, May 4th, but overall I want to express how grateful I am for getting to be a part of it, because it was without question the most notice I've ever gotten in the field of comics. I got to work on two books that people around the country (and, heck, the world) actively sought out and read not because I talked them into it at a convention or because they were being nice, but because they wanted to and had a genuine interest. That's very rewarding and it's something I've worked toward for quite some time. Beyond this, I was able to travel to Boston to meet comic fans and, specifically, fans of the Tick, all of whom were gracious and friendly. Not only this, but the staff of New England Comics was generous and accommodating to the point that I felt like blushing on several occasions. It was all very overwhelming, something difficult to put into words. I realize that comic book careers, such as they are, can be fleeting. Even if I fall off the face of the earth tomorrow (a distinct possibility, considering how close I live to the edge of the earth), I'll appreciate the time I got to spend in this alternate reality where what I do for fun actually means something outside of my small understanding of existence. So what I'm saying is that I had a good time. But enough of that junk. 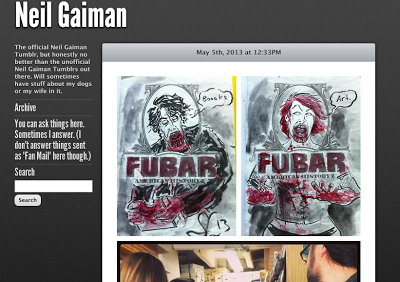 Let's see what the world had to say about some of the stuff I did for Free Comic Book Day! 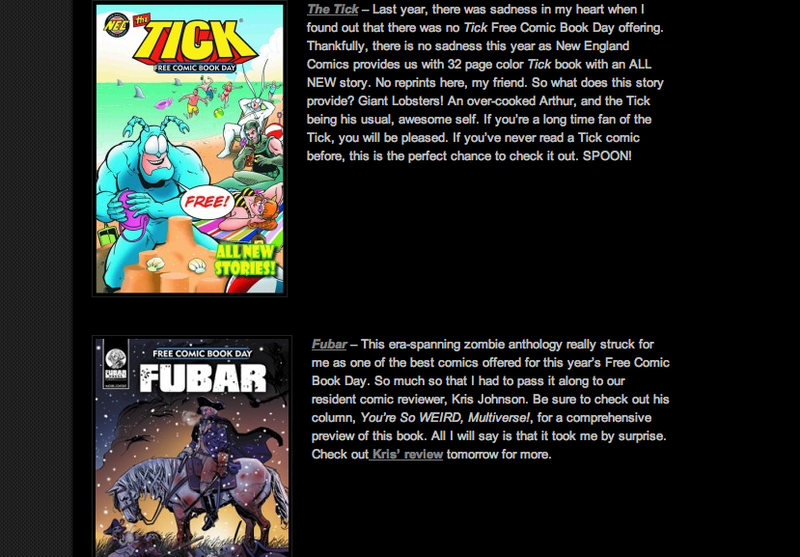 Probably the most positive review I saw of both The Tick and FUBAR came from the website "Geek Hard", which not only reviewed both of them, but reviewed both of them consecutively, as the image above displays. 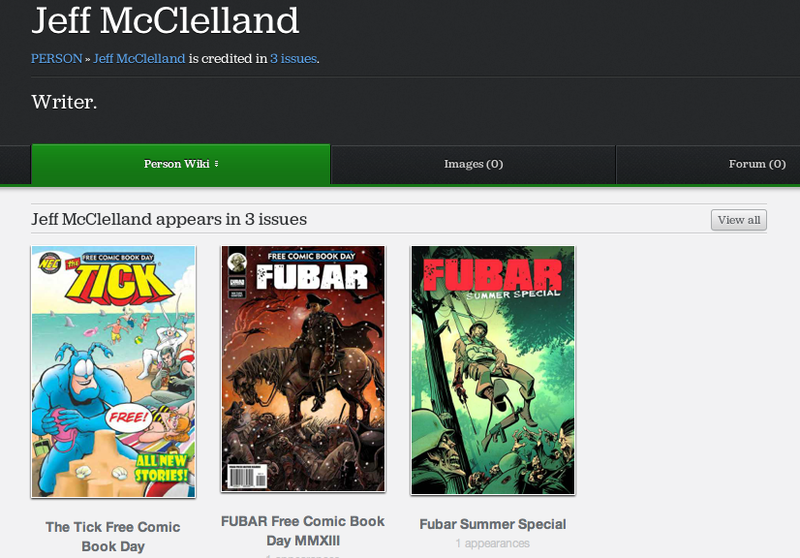 It seems that the website staff enjoyed both books, and they enjoyed FUBAR enough to dedicate a specific review just to that book. USA Today had several articles about FCBD, and both books were mentioned by the newspaper giant. In their overall guide, FUBAR was highlighted as a suggested pick for people who like zombies (which seems obvious, I'll admit), with the author saying, "for something completely different, give FUBAR a spin." 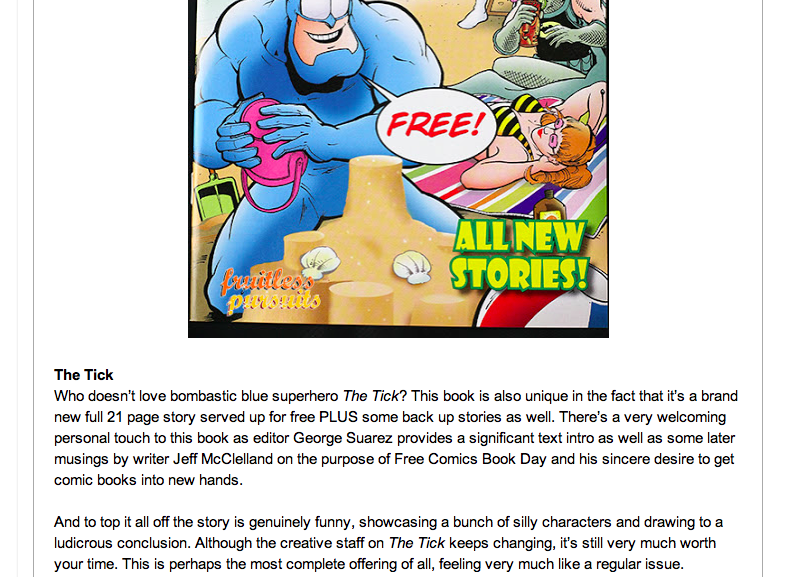 In their list of 10 books to pick up, the Tick made it as the number four recommendation! 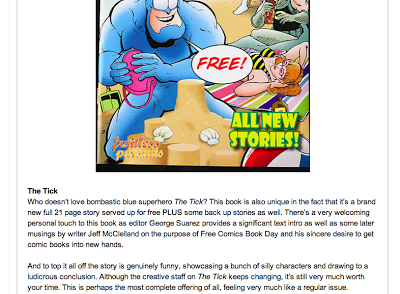 The websites "Fruitless Pursuits" and "Paradox Comics Group" also had nice reviews of The Tick, with Fruitless Pursuits saying that the issue was "perhaps the most complete offering overall", and PCG scoring the book a 7/10, saying the book "raises a smile", specifically mentioning the two short backup stories with art by Pietro. Comic database websites were also quick to be updated with information from the two FCBD offerings, and, surprisingly enough, I genuinely had nothing to do with it. Comic Vine even has a personal entry for me where before there was nothing (that I know of), and Comic Book DB has a fairly comprehensive list of the books I've worked on, as well as information like...my birthday. Did I put that in a long time ago and forget about it? It's...it's possible. But someone has updated the page, at least, to include several of my more recent books, including some of my lesser-known contributions to books like Hawken and Apes with Uzis. Perhaps if my OCD gets the best of me, I'll complete the list...for posterity. Yes, that's it. Comics superstar (he's also a superstar in other areas of life) Neil Gaiman posted some FUBAR art on his Tumblr page! Yippie! "Earth 2 Podcast" did an audio review of some FCBD books, and the Tick was front and center, at about the eight minute mark of the program. The guy doing the reviews HATED it! I mean, really despised it. This is pretty funny, and as strange as it sounds, it's an accomplishment in its own right. If someone hates your work, at least they care enough to have an opinion about it. When no one cares one way or another, it's a little worrisome. But yeah, this guy liked nothing about the book at all. 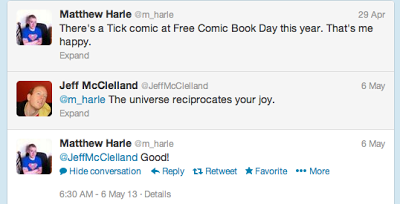 Twitter was abuzz with reactions to Free Comic Book Day, and the Tick got a few mentions over the infosphere. I even sent some copies to a few of the folks who couldn't find any for themselves. One of the funniest things to come from the FCBD weekend was seeing issues of both books pop up on eBay, and especially this, pictured above - someone who stood in line to get an autograph on the 4th put their copy online to sell, assuming that someone would actually like to purchase a book that I both wrote and wrote on. Furthermore, the person started the bidding at an exorbitant $19.99! And to top it all off, someone actually bid on the damn thing! This means that my signature is worth somewhere in the neighborhood of 20 dollars. Of course, that's absolutely not true, and it's kind of silly that someone decided to spend money on an autographed copy of the Tick FCBD 2013 special. This book had a healthy print run, and I'm sure that copies of it will be floating around for just about eternity, and they'll be easy to find, to boot. 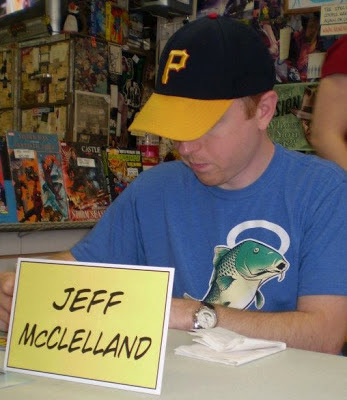 So if you're reading this post, and you've managed to make it all the way down here, take some good advice from your ol' pal Jeff: don't spend $20 on this book! I'm sure you can find a cheap copy somewhere, and if you want me to sign it for you, heck, I'll accommodate for no charge. Promise. Free Comic Book Day 2013 was a pretty special day for me, and I'm happy to have been a part of it. It's been very rewarding to read some feedback, and I'm relieved that most of it has been very positive. There's more to come from both properties, I'm happy to say, so here's to bigger and better things in the not too distant future. Thanks to everyone who made this a great series of events for me. Magic Bullet #6: The Naked Man! Lost in the shuffle of Free Comic Book Day and other such festivities is news that a new issue of DC Conspiracy's Magic Bullet is out! 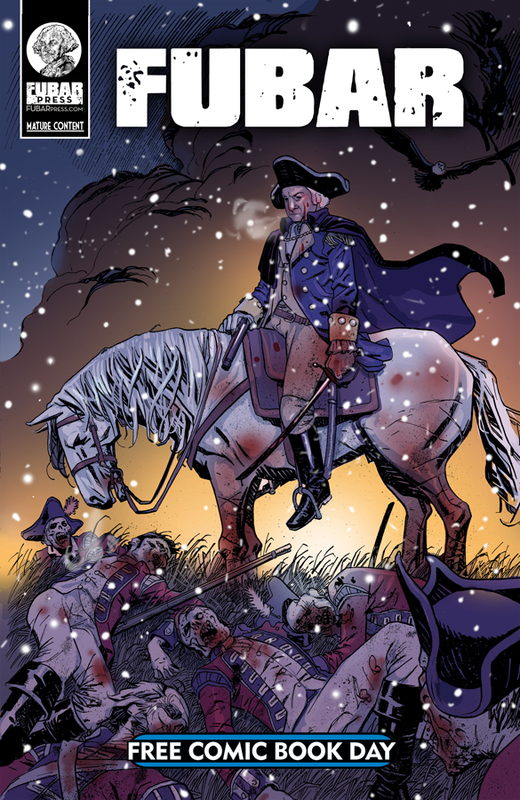 Issue 6 of the Washington, DC-area free comic newspaper in on stands now, and it features an oversized, one-page comic written by me that you can read by clicking the image above. My entry is titled "The Naked Man at the Edge of Time", and it's drawn by Kurt Belcher with inks by Jonathan Brandon Sawyer and greyscales by Tom Ziuko. It's about a guy who time travels, but has to do so naked. That's...pretty much all you need to know about it. I got the idea while reading an issue of Dark Horse Presents, specifically a story titled "The Marked Man". I just glanced over the title and had to look at it again, because I mistook "Marked" for "Naked". Who knows what kind of Freudian analysis that conjures, but let's just take it for what it's worth. Anyway, I thought the idea was funny, so here we are. The whole issue turned out really well, if I can say so. I love the format and I love the idea of a bunch of creators getting together to work on something of this scale. It's pretty neat. Also in the issue, FUBAR bigwig Steve Becker gets inadvertently name-dropped in a story...about...heck, it's a comedy story about a time traveler. Oh well. This issue also features an ad for Franks and Beans! That's right, we convinced someone to actually advertise for our Internet show. I'm sure this will drive viewership through the roof...I mean, if it wasn't already. THE ROOF, I TELL YOU! I do have plans to do more with the Naked Man. Okay, that sounds a little weird, but you know what I mean, right? The Naked Man idea. That doesn't sound any better. Whatever, there are still plans for a full length (that sounds bad in this context as well) story later this year. I'll post updates...whenever. This comic strip will make its way onto the webcomics section of this site. Look for more soon! Hey, let's take a look at some more of the Thing sketch cards I have! WHY NOT!! Puis Calzada - Like many of these cards, I grabbed this card on eBay, and if I think about it, I'd say that this is the card that really got me into collecting these things. It's another example of a card with color, and it's a full body shot - two things I don't see too much of in the sketchbook. It's a pretty cool image. Roger Andrews - The art on this card might look somewhat familiar. If you think you've seen it before, chances are that you just might, because Roger Andrews is an artist whose art can be seen on Marvel's Super Hero Squad-brand toy packaging. This art is indicative of the style of the kids cartoon branding, and it's got a whole lot of action packed in to such a small space. 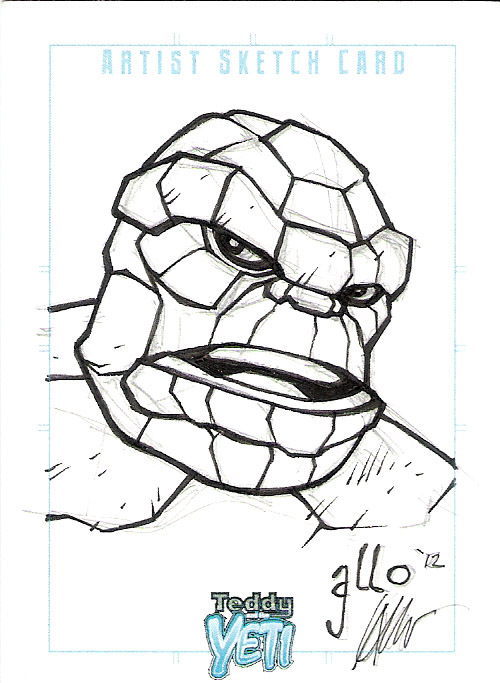 Ken Hunt - I ran into and harangued artist Ken Hunt into drawing me a Thing sketch at a recent Steel City Con. Ken's been moving up in the comic book world recently; pay attention and you'll see his name attached to a big-time project coming up very soon! Alan Gallo - Alan's name is a familiar one around these parts. He's worked on such comics as Teddy and the Yeti and the two-page Franks and Beans story. 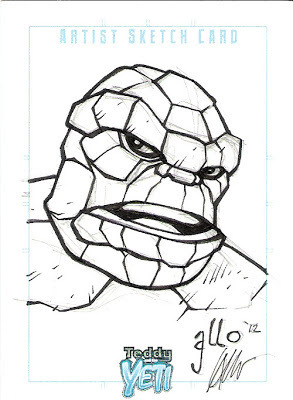 I recently bought a few pages off of Alan and, never missing an opportunity to put my friends in a tight spot, I managed to get him to send me a Thing sketch as well. This is definitely Alan's style and I love it. Rafer Roberts - Here's a classic Kirby-inspired Thing from Rafer Roberts. Rafer is another familiar name around these parts as he's worked on previous volumes of FUBAR. 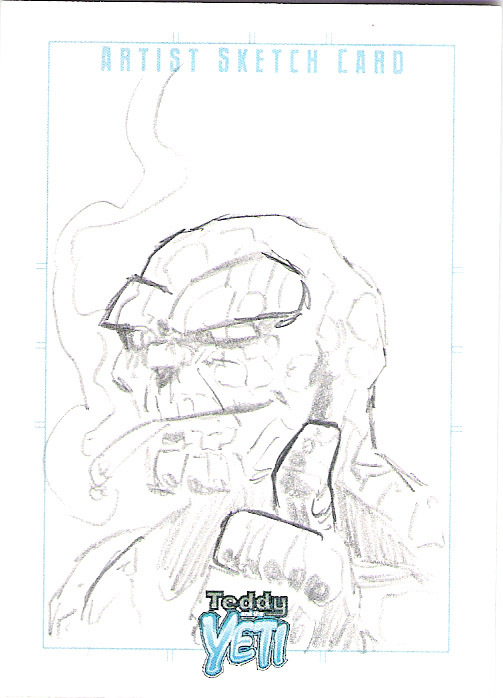 I picked up this sketch card after I pledged a few bucks to a Kickstarter project. I love the look of this one. There are more to come at some point! 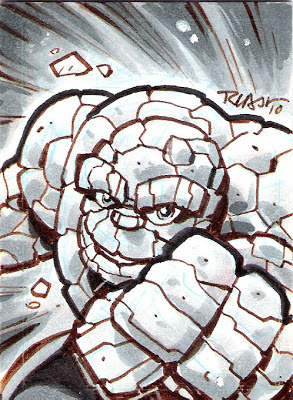 This is all a part of my master plan to deluge the internets with images of the Thing! Free Comic Book Day is over for the year, but there are still lots of things to talk about and show. For instance, pictures of me sitting at a table, looking like I am perhaps sleeping! What intensity there is to this blog. 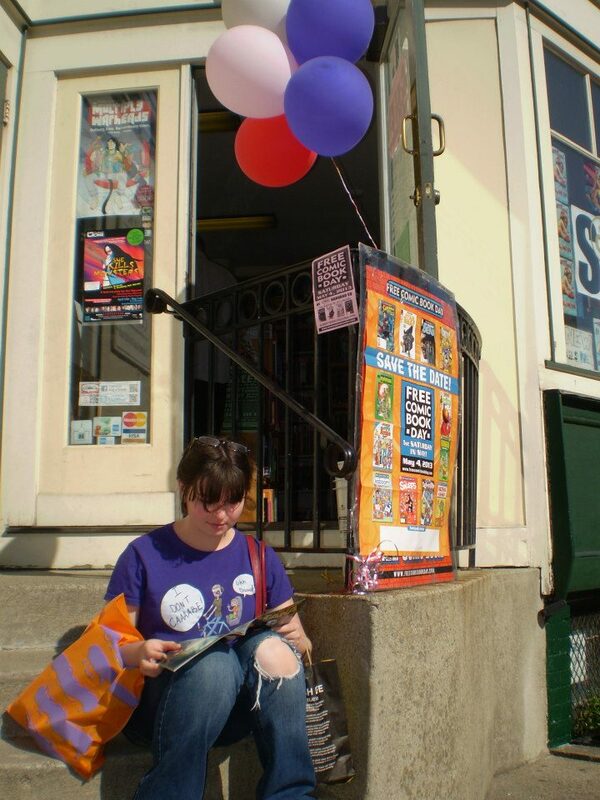 Oh well...here are a few more pictures from last weekend's FCBD event at New England Comics! I hadn't previously met either of the two, and it was nice to meet in person some folks I had worked with on the newest FUBAR volume. Wood was there with copies of her book Flutter (with art by Jeff McComsey), and I picked one up before the two left for the evening. For no reason at all, I brought a few Teddy and the Yeti sketch cards with me. 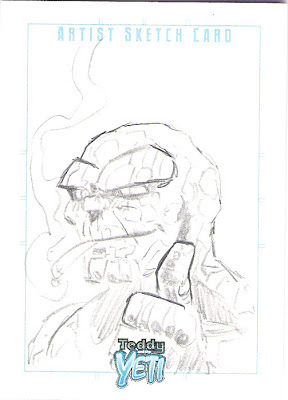 If there was a rare slow moment, I scratched out a terrible looking Tick sketch and handed it to a kid, who didn't know any better and generally liked it. 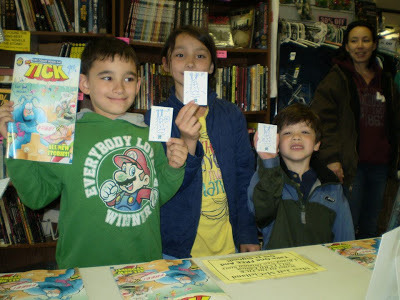 Near the end of the day, I gave one out to the kid on the right, who liked it so much that he brought his older brother and sister back to get ones of their own. This was fairly embarrassing, as I don't draw well and draw even worse when I have a time limit. Thankfully, these kids left without crying and I was able to recoup some of my dignity before the night was over. Here's a shot of the outside of the store. That's...all I have to say about it. 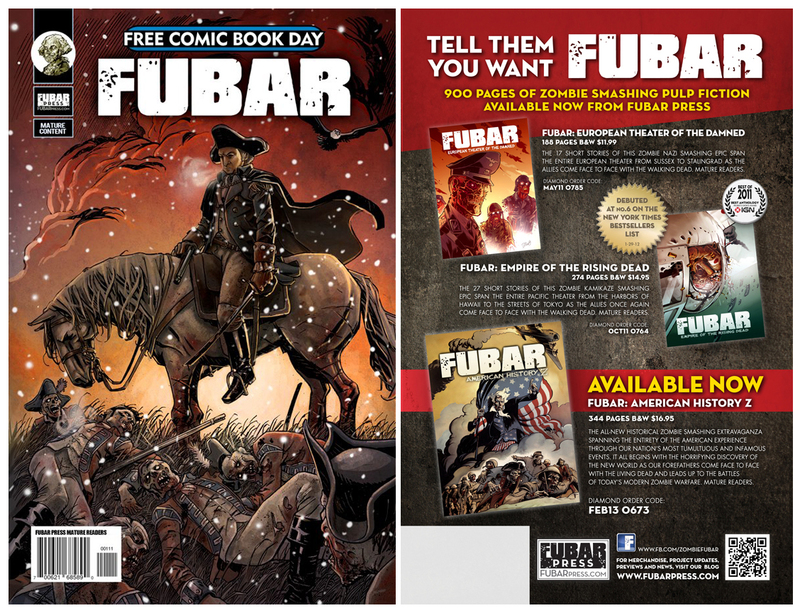 On Sunday at noon, I had another signing at NEC Malden, where I managed to give away from FUBAR FCBD books as well as the standard Tick issue. The Malden store is pretty big, and it has a big cutout of the Tick in the front window. The few hours I spent at the store were pretty slow altogether, but I still probably signed a dozen or more books before packing things up for the trip home. Before I left, though, I got a tour of the basement storage. In the basement sit literally tons of Tick merchandise, from stacks and stacks of books to toys to promotional material. It was quite a sight to see. I even convinced the manager to let me rummage through some boxes, and I left with a few books that I didn't already have. Look at these boxes! These are almost certainly sealed cases of toys from the '90s cartoon, just waiting to be opened and distributed. I could have spent days down here, digging and rummaging for Tick treasure, and there is undoubtedly some treasure to be found. But as I had a 10-hour drive ahead of me and it was already early afternoon, I did my best to furiously grab some things I was looking for and I got out of there. Next time maybe I'll be able to spend some more time browsing. It was quite the sight. This weekend was really good to me. The folks at NEC were gracious almost to a fault, and I'm grateful for all of their hospitality. There are some exciting things coming up for the Tick and I'm happy to say that I'll be a part of at least some of it. What a day this year's Free Comic Book Day turned out to be. 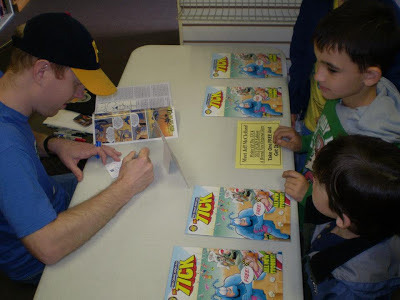 I'm a pretty lucky guy overall (handsome, too), but my good fortune was really in overdrive on Saturday as I got to see the Tick story I wrote in the hands of a whole lot of people. 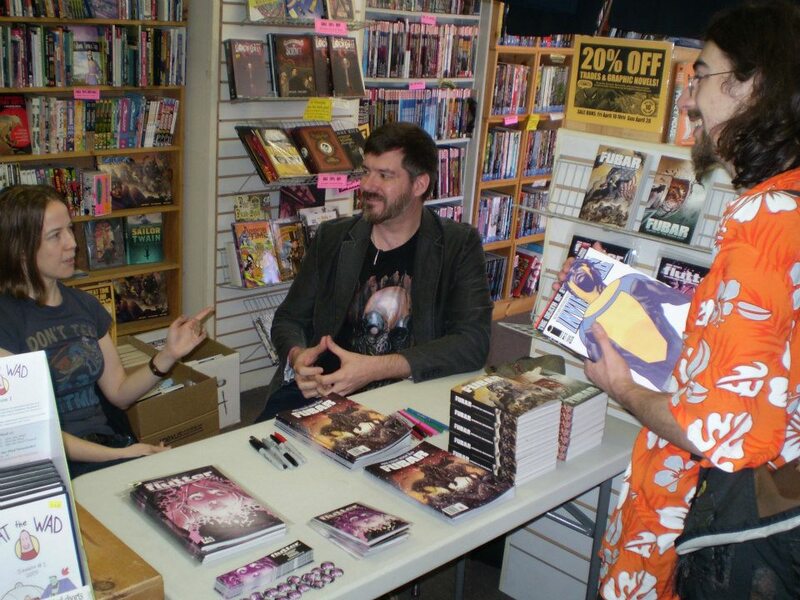 I spent yesterday at two New England Comics locations - Quincy and Cambridge - and I had a great time at each. I'll surely talk more about this later, but for now I wanted to upload some pictures (with a little bit of commentary) from the day. Take a look. I went to the story in Quincy first. We opened half an hour early and there was a line for as long as I was there - until 2:30. I signed a bunch of comics and met some really nice folks. Someone had this shirt on, and I took a picture of it to show Larry - and now the world. The person wearing it couldn't remember where he got it. Pretty neat. At 2:30, I took a train to the Cambridge store at Harvard Square where I met a few superheroes. After I got some fantastic Chinese food (really, the fried rice was quite possibly the best I've ever had), I began the second tour of duty and singed some more. Look! It's Green Arrow, Superman, and awkward-pose-Pirate-hat guy. For a while, I turned invisible as I sat behind the table. We still managed to give away all but six copies of the Tick book by the time the store closed for the night. The Harvard store is a small one, but it's in a great location and it's got some personality. I enjoyed it a lot. At different points during the day, I drew some terrible (really, just horrendous) Tick sketches onto ye ol' Teddy and the Yeti sketch cards. A few people walked out with them. I gave one to a little kid, and he brought his sister and brother back for cards of their own, which was kind of embarrassing. "How are you so good? ", the kid asked. I couldn't find words to answer him, and instead just died a little bit inside. There were only a few books left at the Harvard store at the end of the day. Grimm was, apparently, not a popular choice as there were plenty of those books that remained. 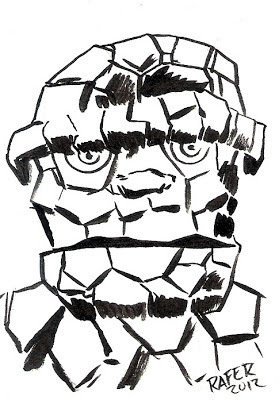 I'll bet that if the books were about Ben Grimm, they would have all been taken in the first few minutes (all over the world). And some cool free comics that I'm gonna read the heck out of. Many thanks to all who came out to one of the stores, and further thanks to New England Comics for having me in town for this event. 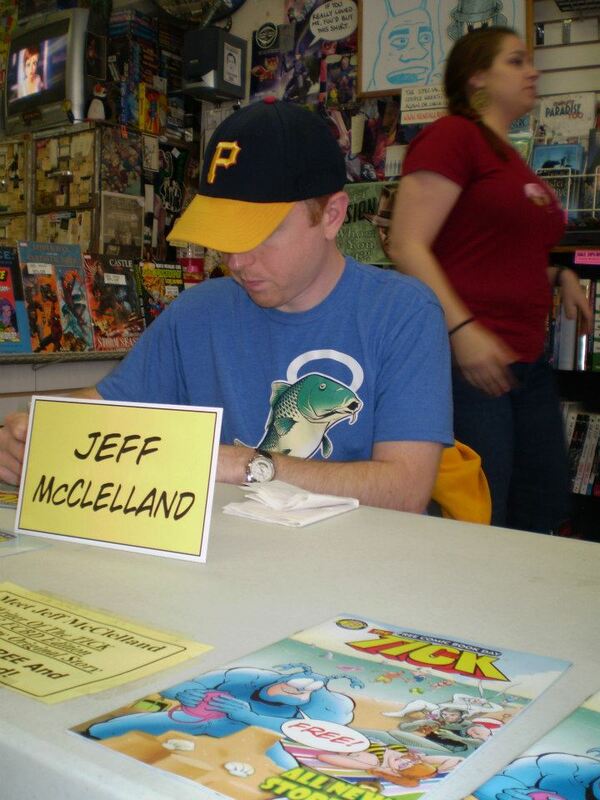 I will be at the NEC Malden store tomorrow from noon to 2:00 pm to sign a few more comics before heading home. I hope that others elsewhere were able to pick up the book and that there was some enjoyment to be taken from it. 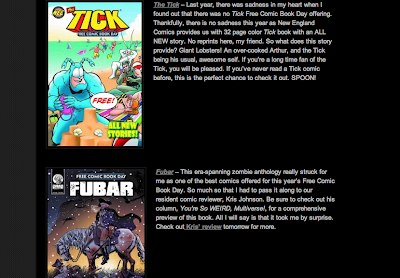 If you picked up either the Tick or FUBAR (or both), I hope you'll let me know what you thought of them. 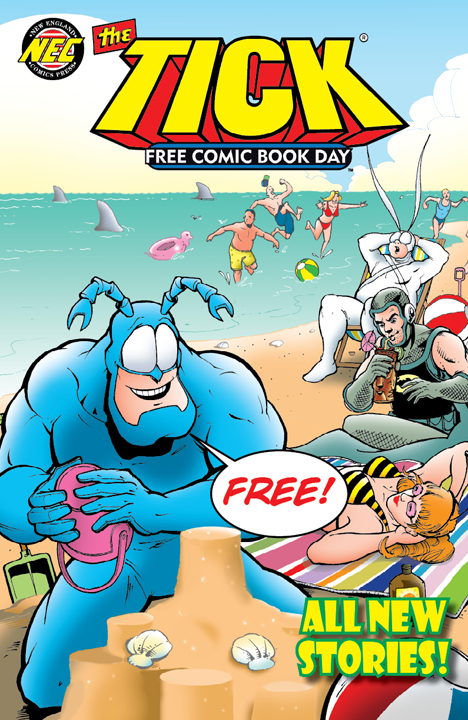 Free Comic Book Day is here with the Tick and FUBAR! Happy Free Comic Book Day, everyone! Today's a day that I've been looking forward to for quite some time, as I get to pick up some great free comics...and also a couple that I did a little bit of work on. I hope that we all get a chance to make it to a participating comic shop today for the event - and if you're out there and you happen to see a copy of the Tick or FUBAR specials, well, I hope you'll grab one of those as well. As a personal favor to me. I'll owe you. I was able to write a two-page editorial piece for the Tick special. Here is proof that I mentioned Franks and Beans in a publication being distributed around the world. If anyone picks up the book and finds this page as a result, I hope you'll let me know what you thought of it, good or bad. According to the above screenshot from Reddit (sent to me by FUBAR EIC Jeff McComsey), someone is preparing to bring things to one of the stores for me to sign. This is pretty bizarre, but of course I will sign anything (car tires, dog collars, liquid nitrogen) that anyone brings my way. 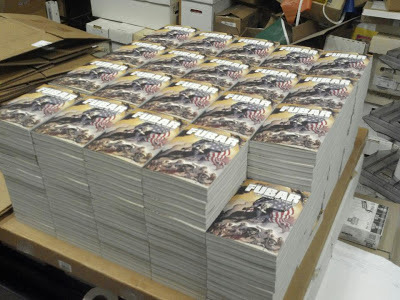 This is the stack of the newly-released FUBAR: American History Z that Beyond Comics in Maryland ordered in anticipation of either the apocalypse or some brisk sales. There's nearly 200 books piled up here. AHZ came out in stores last Wednesday - just in time! - and hopefully they're in a prominent place come tomorrow. And as we all know, Mug Cream Soda is hard to come by in Pittsburgh for some ungodly reason, so whenever I take a trip that takes me anywhere near New York City, I stock up. Suffice it to say that I'm stocked up for a little while, now. If you're in the Boston area, stop by tomorrow or Sunday and say hi. If not, you can still, as incredible as it sounds, enjoy Free Comic Book Day without seeing or coming into physical contact with me, so I hope you still make it out to grab some free books. I'll post some pictures from the day here soon, so you can wait in staggering anticipation until those arrive. It's a big day.